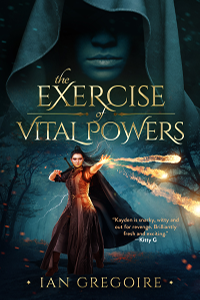 After having previously received a great review from Kaitlin, as part of her role as a judge for this year’s Self-Published Fantasy Blog Off, I’m back on Cloud Nine again after reading a wonderful review for The Exercise Of Vital Powers by Angelica, posted on her blog The Effervescent Bookworm. While simply receiving a positive response to my novel is enough to put a smile on my face, what I really appreciated most about Angelica’s review was her reaction to my protagonist, Kayden Jayta. As Angelica noted in her review Kayden can’t really be described as a heroine; she does some pretty questionable things at various points in the story, with no regard for the consequences and little care for who gets hurt in the process. Nonetheless, Angelica actually liked Kayden and had some some very complimentary things to say about her, which was especially gratifying to me because my greatest concern while writing The Exercise Of Vital Powers was how readers would react to her character. I knew from the outset that Kayden would be a difficult character for most readers to root for, and that they might very well find her unlikeable given she has certain traits that many people find harder to forgive in a woman. With this in mind I really went out of my way to ensure that she was (at the very least) a compelling and memorable character, in a good way. What I really wanted to avoid was having readers literally hate her, after all, who wants to read a story about someone they hate? Fortunately, I’m starting to believe I have succeeded in that endeavour. Needless to say, not only am I over the moon that Angelica really enjoyed reading The Exercise Of Vital Powers, I’m particularly pleased that she understood why Kayden is the way she is (and why she says and does the things that she does), without holding it against her. Hopefully I have acquired a new fan in the process who will want to read more of my writing in future.